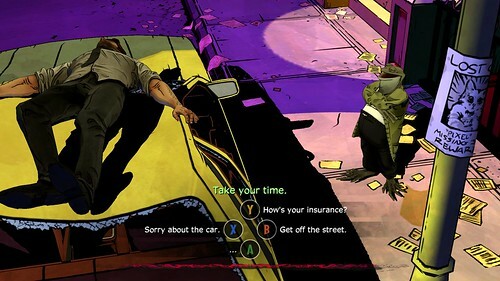 There have certainly been a lot of reviews written since the first chapter of Telltale Games' The Wolf Among Us was released earlier this month. There has also been a lot of praise for the storytelling, the slick yet gritty feel of the game, and how well it fits into the Fables universe. In fact, Bill Willingham himself announced at the Boston ComicCon that he was so pleased with the story that it should be considered canon and now belongs to the official timeline of his characters. Being the enthusiastic Fables fan that I am, I made a point to play the game as soon as it became available, poor video game playing skills and all. I have written before about my love for Telltale Games and their take on the old adventure games, so I felt that my favorite comic was safe in their capable hands. The question is however, did they meet my expectations or is the game something more special than that? Is it truly a playable graphic novel? It is early to tell, but let’s talk about where things stand, shall we? 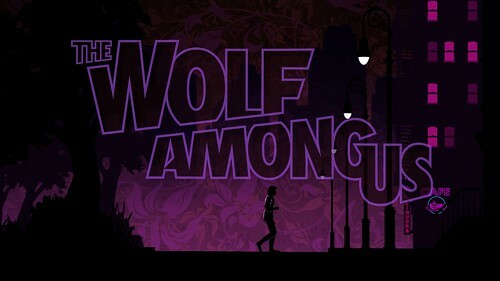 The Wolf Among Us is a prequel, meaning that the events in this story take place before the first Fables storyarc has begun. This meant that when it came to judging Telltale’s take on the characters, I needed to refresh myself on who the character used to be and try not to focus too much on who they are in the more current stories. I was pleased to be reminded of how much each character has grown since the beginning of the series, and the writers at Telltale seem to be on the same page. As a result, I'd like to use this post not discuss just the gameplay, but focus on how Telltale translated the personalities of our two of the main characters in this chapter - Bigby and Snow White. Bigby is the easiest to discuss because he is the player character; you have a lot more power over who you want Bigby to be. And in my opinion, this is where the game really shines. The range for Bigby is so well developed that you can choose anything from a snarky world weary kind of guy trying to move beyond his past to a man who is clearly still very much the animal within. You can reason with your suspects or punch first and ask questions later. The best part is that Bigby is still Bigby and no matter how hard you will try, you are still subject to his limitations. You can have him try to distance himself from his past, but it is always there. You can try to make him be a jerk, but Bigby cannot escape the part of him that is inherently good. From the comics, we know that Bigby is on his way to being a better man. In the game, we can try to kick start change in more or less graceful ways. The other main character we see a lot of in the first chapter is Snow White. She comes to Bigby for help with a very ugly situation she discovers at the Woodlands Apartments. While playing as Bigby gives us several opportunities to create the Bigby we want, our interactions with Snow are limited to her reactions to us. This means that the player is restricted to a much more limited take on Snow White. For me, and my notions of who Snow White was at the beginning of the comic series, this was challenging. I am not saying that the writing for Snow isn’t good, or that the chosen voice actor isn’t talented, she just isn’t quite my Snow White. The Snow I always hear in my head when I read sounds more sure of herself. She is confident but also a bit burnt out and tired of the constant struggle to maintain Fabletown. Her goals are clear and while she is open to advice on how to get her ends, she isn’t afraid to call a spade a spade. The Snow White in this game could be all those things, but there is something about her delivery…a nervousness that could be a result of the situation, but can often feel a bit off. There are times when I expect her to be a little colder or matter-of-fact. Yes, she is worried about the ultimate fate of Fabletown, but early on in the series she could often come off as cold and all business. I am hoping that we might get more of that side of her in the future chapters. And if that doesn't happen, I am hoping to adjust to the Telltale interpretation of her more. Concerns about Snow aside, it is very exciting to experience the universe of Fables in a new way. It feels like Fables and the various paths you can take make even this single chapter something you can replay. I feel like Telltale has given us a lot more to explore than you can get from a single play. In fact, I am extremely eager to get my hands on the upcoming chapters because I want to see not only how the story pans out, but also the other characters we might run into. I have my own wish list at the ready, but I guess we will have to see what Telltale Games has in store. While we wait for the next chapter, feel free to let us know what you think about the game so far? Happy with the story? Are the characters up to snuff? Comment below!